The sheer number of YouTube videos out there on how to care for and cook with cast iron is impressive. I think it’s interstesting, though, and a little humorous that people seem to think there’s so much mystery surrounding using the stuff. It’s a tool, for God’s sake. A good one, and one that’s almost indestructible. Why is how how to season cast iron have to be such an infinitely discussed topic? It’s not rocket science. How ever a person decides to season a cast iron skillet, it’s seasoned. As long as you don’t scrub off the pan with soap, it stays seasoned. Did you screw crew up your pan somehow? Burn something in it? Leave water in it and it rusted? Throw it in a fire for awhile, or turn your oven up to $500 and stick it in there for an hour. Wipe it off, put on a light coat of oil, and it’s god to go again. They just work, and they last for ever. Just use them and eat well. white cloud, Mark Risch, Shooter4570 and 13 others like this. 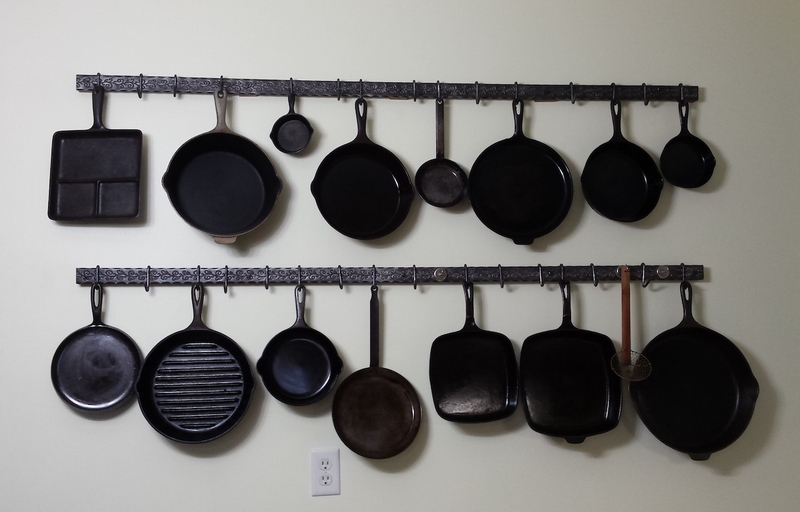 I have lots of cast iron. All from great grandmother and grandmother via my mother. If you are not cooking corn bread in a square cast iron skillet I would advise you to start looking. I throw kosher salt and wipe iron cleaning. If I need a little water that is fine, I just throw it back into the hot oven to assure no rust. We found an antique store decades ago in South Dakota that seemed to specialize in cast iron, from great to really crap condition. We bought the crap, reconditioned and use it still. turbobug, kah64, DRSLYR and 1 others like this. The new cast iron is all crap. It is so rough that no amount of seasoning will help. Thank God we have old stuff passed on from Grand parents. kah64 and marlinluvr like this. I have an old Griswold but I bought a brand new set of field skillets and they are just as good as the old stuff. kah64 and VinceA like this. You have to spend some time with an orbital sander to smooth out the coking surface on new "iron". My old Griswold "iron" gets used daily and is virtually non stick..
10acres, F150Grrl, Golphin and 4 others like this. I have a few of my grandma's Wagner skillets that I still cook with. I have a new Lodge 10" dual handle skillet that I use for baking and a Lodge 8" skillet. Even though they're rough, I haven't had a problem with anything sticking. My sweety and I love to hunt for cast iron. Skillets, chicken fryers, griddles, etc. good at the restoration process. We too, use ours daily, and take good care of them. The stove got too crowded. Found the bar stock. Drifter hand formed the hooks. And we had us a new home for our stock. kah64, 256WinMag, Golphin and 8 others like this. I've had pretty good luck with the new stuff. I've got Lodge from 5-25 years old that is seasoned well and non-stick. I also have some Griswold that is still a little sticky. I guess I need to season it more. It seems a little counter intuitive, but I think the "roughness" forms pockets of oil and steam that keeps it from sticking. My wife recently bought a set of "modern" non-stick cookware that feels like 60-Grit sandpaper to the touch, but nothing sticks to it! Back to ditto1958's post, I was on a Lodge thread about seasoning and several people posted their methods and, of course, a Lodge Rep posted their suggested seasoning process. All methods were different, but I'm sure would produce a serviceable cook surface. Then, someone posts that they've worked in restaurants and the Health Department requires all cooking utensils be cleaned with detergents, and sanitized. The OP then disregards the wealth of advice and commits to using their dishwasher. Some people shouldn't have cast iron. My wife makes an iron skillet apple pie that's the best! BuckyBadger and Padraig like this. Everyone has their own way of doing it, but I'll put some hot water in the pan, heat it to boiling and clean it with a plastic scrubbie. Dump that and put it back on burner to heat dry. When it's really good & hot I'll pour a small amount of cooking oil in it and spread around with a folded paper towel being careful not to burn my fingers. Push it aside to let cool. If it's not sanitized when I'm done, those are some tough germs. kah64, Chigger and jog like this.